Just a girl with a hammer: It's still growing. I know! Quick, what are some winter annuals I can put in its place? 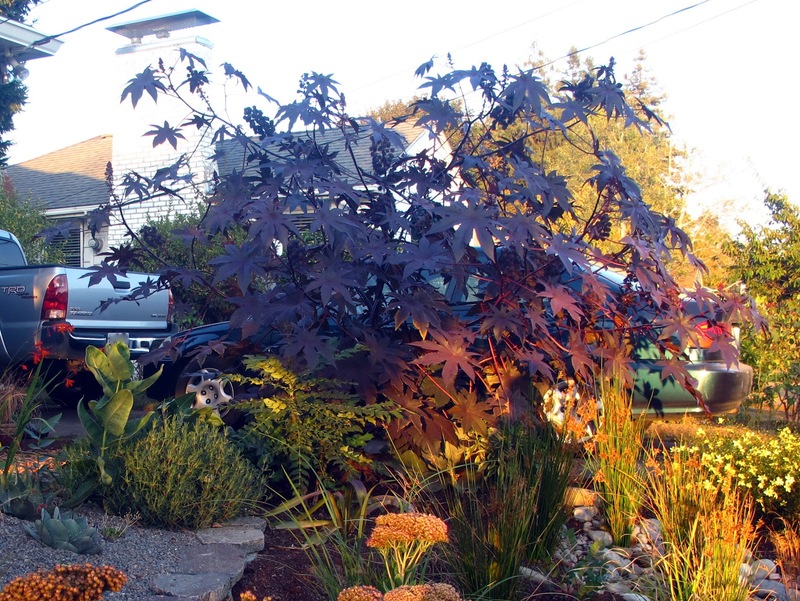 The light on the red of that Castor Bean is just wonderful. It hurts to lose a favored annual or hefty perennial- I'm already mourning my Tetrapanax and it isn't even going yellow yet. But go "Arthur Menzies"! Gorgeous light...and the new growth on that Mahonia is fantabulous! I'm learning from you--gotta grab that beautiful dusky light when I can! They told me I could grow mahonia here in New England, but they were wrong. I had some crisp brown piles of rubble and never saw the beautiful rich glossy leaves you have. I'll just have to come here to watch your mahonia leap to life. Beautiful lighting! I'm really hoping it flowers this winter. I can't wait for those yellow blooms! That's too bad you can't grow it in New England--they always say what a tough plant it is. Maybe you should call it your Honda Bean Plant. Your yard is coming along beautifully.